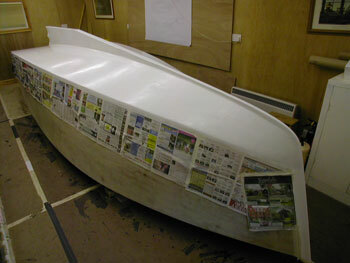 Sticking to the plan I outlined last month I flattened off the hull, rubbed it down with alcohol and gave the underside its first coat of white undercoat. Next I'll do the sides, flatten it all off and give it one more coat before top coating. Meanwhile the bike project continues to take shape. The first challenge was to build the wheels. 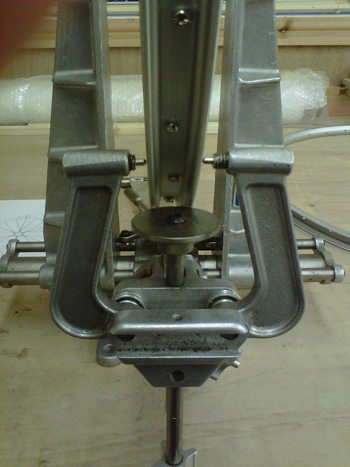 Here I got lucky and a colleague lent me a wheel trueing jig. A lovely piece of kit. I have chosen to spoke the front wheel in a semi radial pattern as there is no tractive requirement and it maximises lateral stiffness, although not to the level of a radial spoke pattern it's quite close and looks great. Here's the important stuff for checking the lateral and radial run out. 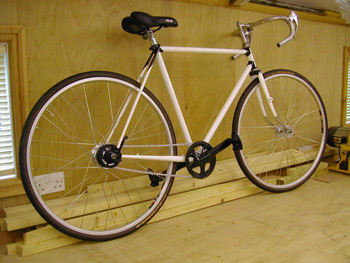 With careful tuning of the spoke tension you can get the wheel trued to within a few thou' laterally. 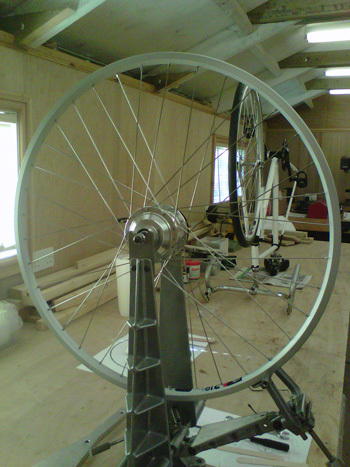 Radial trueing is harder and more time consuming as you have to adjust more spokes. 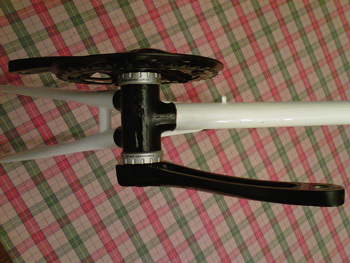 Here's the rear wheel laced in a conventional 3 cross pattern. 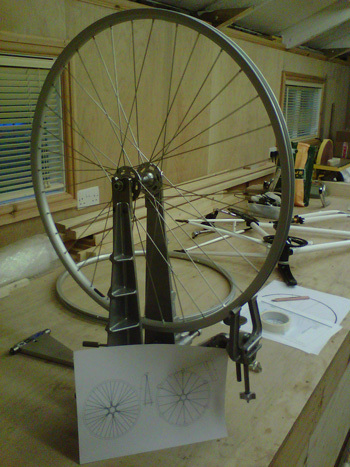 If you fancy having a go check out Sheldon Brown's article on building wheels. Meanwhile, the local bike shop fitted this external bottom bracket for me. Doesn't it look so clean and simple without all that deraillieur stuff. There's still a bit work trueing up the chainstays before I can tighten it all up and fit the chain. But it's getting close. The Alfine 11 speed hub was acquired from Farnham Cycles and all other parts from SJS Cycles, both companies have been very helpful with advice and prompt delivery. For technical details check out Shimano Alfine.